Krishna is one of India’s most loved Gods. His birth and his life are nothing short of a typical Masala Movie! Grandson of a king, his parents imprisoned by his uncle who usurped the throne, born in a prison after six of his earlier siblings were brutally killed by his uncle, born when the Yamuna was in spate, working miracle after miracle to ensure his transfer from the prison to Gokul where he was brought up – who needs fairy tales when Indian mythology is replete with stories like this one? The miraculous birth of Lord Krishna is what the country celebrates as 'Janmashtami'. Janmashtami as it is is a fairly quiet event, with prayers offered in temples, delicacies cooked at home, and people staying awake well into the night chanting the Lord’s name. In South India...., there is a practice of drawing baby feet impressions using a paste made of rice flour all over the floor. This symbolizes the fact that the lord had come to the house. So, the foot prin ts begin at doors, windows and walk all over the house! As kids, it was great fun getting together to draw and make a mess all over the house. And back in villages, where houses run into 10 to 12 rooms and multiple stories, I guess the fun would end making way for a backache the following day! At night in almost all temples, devotees gather chanting the lord’s name well into the night! A small cradle is put up with a small idol of Lord Krishna and with the traditional Arti, the Lord is welcomed into the world. People gather at the temple for the Arti, and then rock the cradle as they would a real human child! The God is officially born!!! Every parent with a naughty child would like to believe that her son is just like Krishna. Krishna was known to be a mischievous brat, troubling the 'aunties' of the neighborhood by breaking into houses with his friends, climbing the ‘boy-pyramids’ built by his friends, and stealing and eating butter. In today’s world, this is celebrated as Dahi Handi. Well, the butter is replaced by colored water, the climbers are all youngsters who practise for months - in open grounds, trying to perfect the art of standing steady while balancing themselves as they stood on someone else and allowed some others to climb atop them! Sounds bizarre? Yes, the celebration includes public suspension of clay pots on roads at a height of 5-7 stories and trucks of ‘participants’ coming over to try their luck at climbing and breaking the pot. And Krishna got butter in return; these boys get money in return! 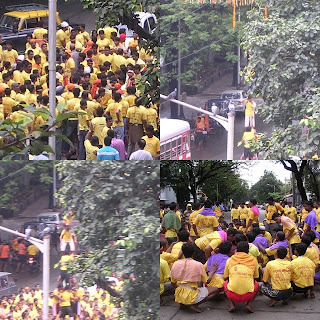 So Janmashtami makes so much noise, because these days, the celebrati ons have begun to be more ‘public’. Well yeah, the minute more than 3 Indians get together, there is bound to be noise! So we have different sponsors putting up earthen pots at different heights. Between buildings, supported by lamp posts, anyhow, anywhere. Middle of the road? Who cares???? Drums and beats to ‘encourage’ the participants as they start the human pillar buildup and ascent, all to the tune of an old Hindi movie song – ‘Govinda Aala re Aala’ ! Speaking of Bollywood, there have b een numerous songs starring actors from Shammi Kapoor to Amitabh Bachhan. And these days, in the large pandals offering lakhs of rupees, these people are the star attractions! We have pandals offering Rs. 11,11,111, Rs. 55,55,555 even, depending upon the heights of suspension of the pots. Also, this whole pot breaking routine is a means of making some cool money for lots of young people as they go in trucks as a group, literally ‘breaking pots on the way’! A whole bunch of people spill out of the truck and gather in a huddle. They then mutter a silent prayer and a first group of 10-12 forms by linking arms in a circle. Then the next group of five or six climbs on top of this group and so on. Once the pillar is set and the people look steady, an experienced guy with a small kid hoisted on his shoulders climbs up, and the kid breaks the pot. The beauty is in watching the whole pillar assemble itself and then watch the whole assembly crumble once the job is done! Once a pot is broken, using a sophisticated pulley mechanism, the pot is replaced and the stage is set for a new batch, a new climb and a new break! 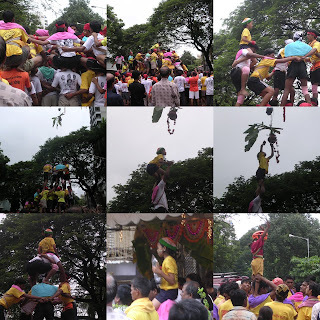 The Dahi Handi festival has been a manifestation of the collective ebullience of the population and festivities are a means to get together and literally make merry! Well, when there is a chance of so much of free publicity, why should politicians let up the opportunity to get noticed? That too during election year? 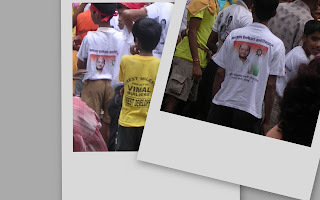 So banners, hoardings, party symbol impressions on t-shirts, sponsors, prizes, you name it, they do it! The result – diverted traffic, although no one complains, splotches of colored water on the roads almost every 100 meters, the same Govinda aala song, multi colored young people, drums and noise……and a whole day of festivity!